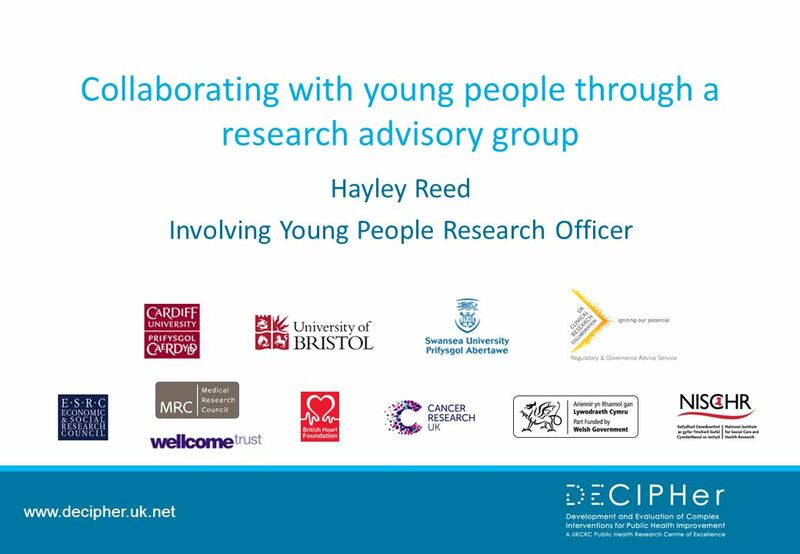 Www.decipher.uk.net Collaborating with young people through a research advisory group Hayley Reed Involving Young People Research Officer. 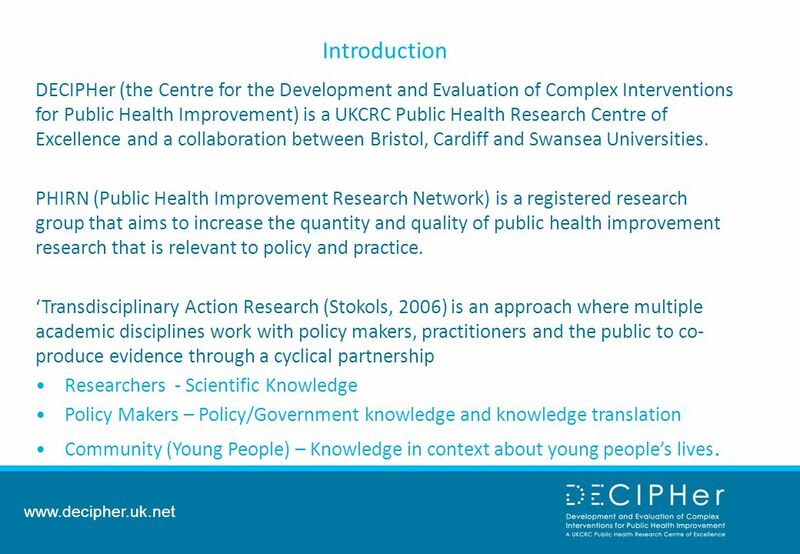 2 www.decipher.uk.net Introduction DECIPHer (the Centre for the Development and Evaluation of Complex Interventions for Public Health Improvement) is a UKCRC Public Health Research Centre of Excellence and a collaboration between Bristol, Cardiff and Swansea Universities. PHIRN (Public Health Improvement Research Network) is a registered research group that aims to increase the quantity and quality of public health improvement research that is relevant to policy and practice. 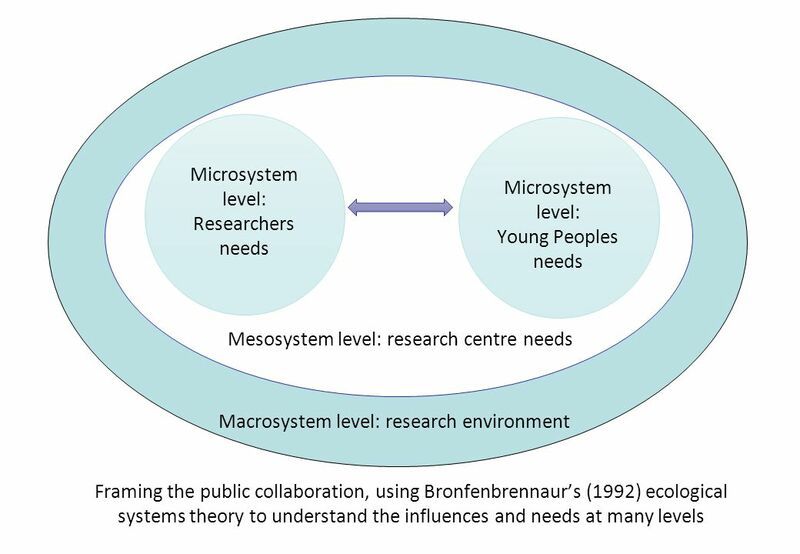 ‘Transdisciplinary Action Research (Stokols, 2006) is an approach where multiple academic disciplines work with policy makers, practitioners and the public to co- produce evidence through a cyclical partnership Researchers - Scientific Knowledge Policy Makers – Policy/Government knowledge and knowledge translation Community (Young People) – Knowledge in context about young people’s lives. 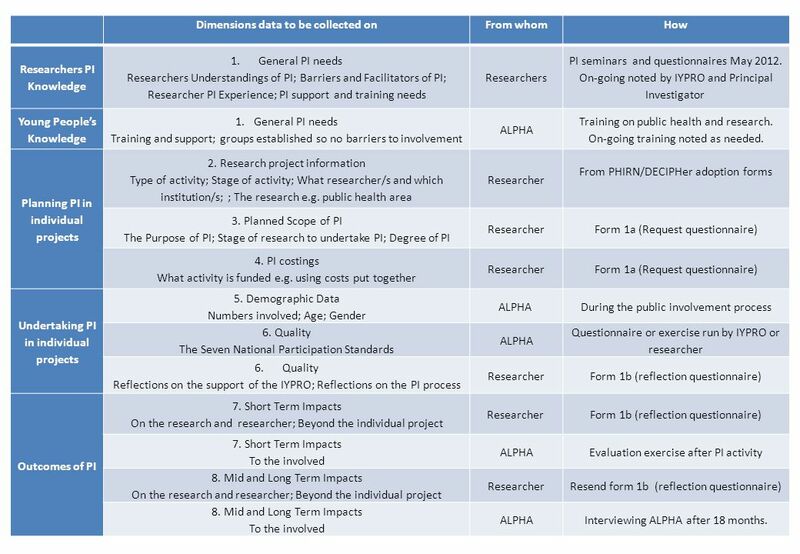 8 Dimensions data to be collected onFrom whomHow Researchers PI Knowledge 1.General PI needs Researchers Understandings of PI; Barriers and Facilitators of PI; Researcher PI Experience; PI support and training needs Researchers PI seminars and questionnaires May 2012. 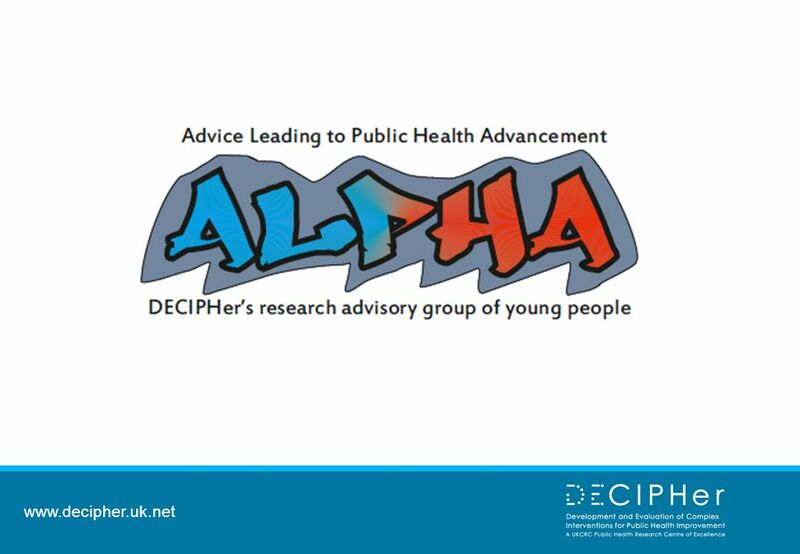 On-going noted by IYPRO and Principal Investigator Young People’s Knowledge 1.General PI needs Training and support; groups established so no barriers to involvement ALPHA Training on public health and research. On-going training noted as needed. Planning PI in individual projects 2. Research project information Type of activity; Stage of activity; What researcher/s and which institution/s; ; The research e.g. public health area Researcher From PHIRN/DECIPHer adoption forms 3. Planned Scope of PI The Purpose of PI; Stage of research to undertake PI; Degree of PI ResearcherForm 1a (Request questionnaire) 4. PI costings What activity is funded e.g. using costs put together ResearcherForm 1a (Request questionnaire) Undertaking PI in individual projects 5. Demographic Data Numbers involved; Age; Gender ALPHA During the public involvement process 6. 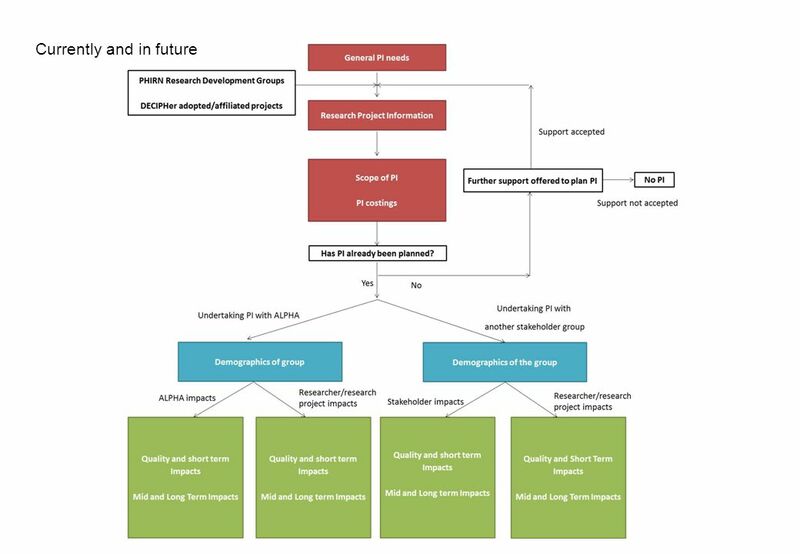 Quality The Seven National Participation Standards ALPHA Questionnaire or exercise run by IYPRO or researcher 6.Quality Reflections on the support of the IYPRO; Reflections on the PI process ResearcherForm 1b (reflection questionnaire) Outcomes of PI 7. Short Term Impacts On the research and researcher; Beyond the individual project Researcher Form 1b (reflection questionnaire) 7. Short Term Impacts To the involved ALPHAEvaluation exercise after PI activity 8. Mid and Long Term Impacts On the research and researcher; Beyond the individual project ResearcherResend form 1b (reflection questionnaire) 8. Mid and Long Term Impacts To the involved ALPHAInterviewing ALPHA after 18 months. 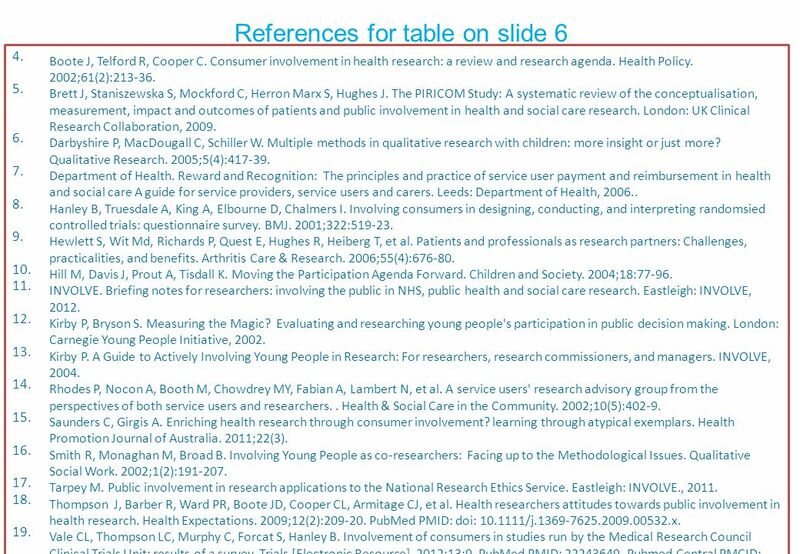 11 References for table on slide 6 4. Boote J, Telford R, Cooper C. Consumer involvement in health research: a review and research agenda. Health Policy. 2002;61(2):213-36. 5. Brett J, Staniszewska S, Mockford C, Herron Marx S, Hughes J. The PIRICOM Study: A systematic review of the conceptualisation, measurement, impact and outcomes of patients and public involvement in health and social care research. London: UK Clinical Research Collaboration, 2009. 6. 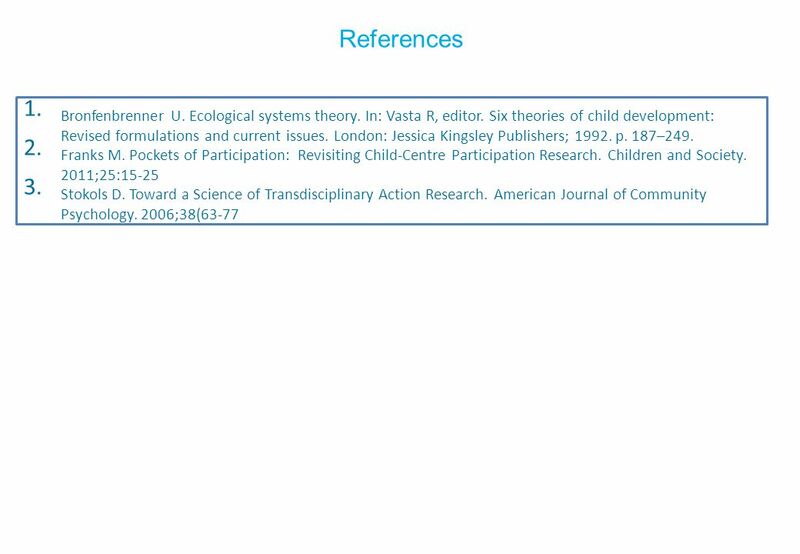 Darbyshire P, MacDougall C, Schiller W. Multiple methods in qualitative research with children: more insight or just more? Qualitative Research. 2005;5(4):417-39. 7. Department of Health. Reward and Recognition: The principles and practice of service user payment and reimbursement in health and social care A guide for service providers, service users and carers. Leeds: Department of Health, 2006.. 8. Hanley B, Truesdale A, King A, Elbourne D, Chalmers I. Involving consumers in designing, conducting, and interpreting randomsied controlled trials: questionnaire survey. BMJ. 2001;322:519-23. 9. Hewlett S, Wit Md, Richards P, Quest E, Hughes R, Heiberg T, et al. Patients and professionals as research partners: Challenges, practicalities, and benefits. Arthritis Care & Research. 2006;55(4):676-80. 10. Hill M, Davis J, Prout A, Tisdall K. Moving the Participation Agenda Forward. Children and Society. 2004;18:77-96. 11. INVOLVE. 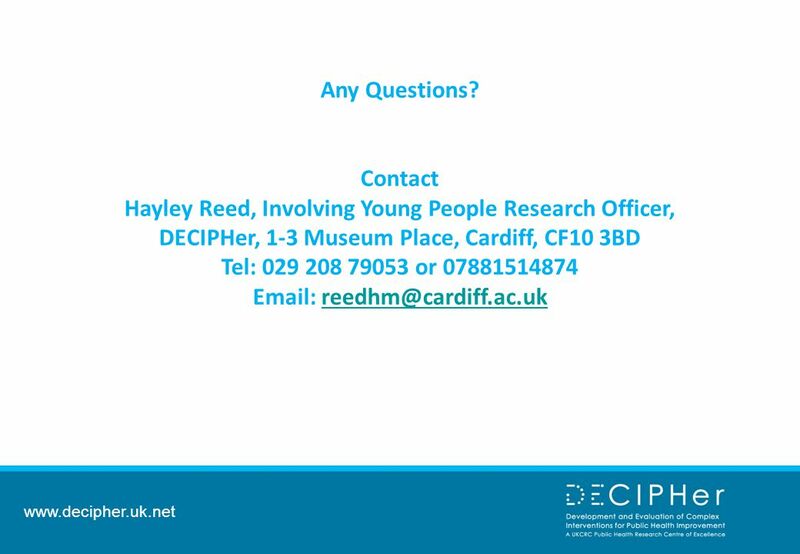 Briefing notes for researchers: involving the public in NHS, public health and social care research. Eastleigh: INVOLVE, 2012. 12. Kirby P, Bryson S. Measuring the Magic? Evaluating and researching young people's participation in public decision making. London: Carnegie Young People Initiative, 2002. 13. 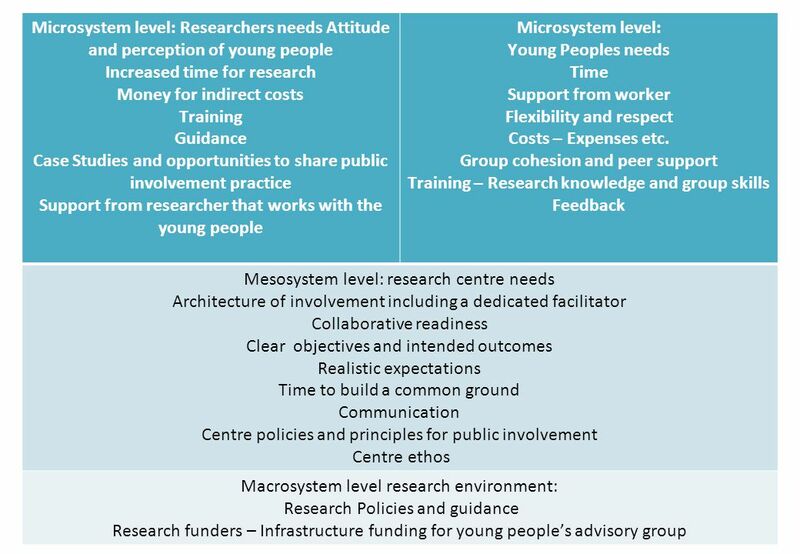 Kirby P. A Guide to Actively Involving Young People in Research: For researchers, research commissioners, and managers. INVOLVE, 2004. 14. Rhodes P, Nocon A, Booth M, Chowdrey MY, Fabian A, Lambert N, et al. A service users' research advisory group from the perspectives of both service users and researchers.. Health & Social Care in the Community. 2002;10(5):402-9. 15. Saunders C, Girgis A. Enriching health research through consumer involvement? learning through atypical exemplars. Health Promotion Journal of Australia. 2011;22(3). 16. Smith R, Monaghan M, Broad B. Involving Young People as co-researchers: Facing up to the Methodological Issues. Qualitative Social Work. 2002;1(2):191-207. 17. Tarpey M. Public involvement in research applications to the National Research Ethics Service. Eastleigh: INVOLVE., 2011. 18. Thompson J, Barber R, Ward PR, Boote JD, Cooper CL, Armitage CJ, et al. Health researchers attitudes towards public involvement in health research. Health Expectations. 2009;12(2):209-20. PubMed PMID: doi: 10.1111/j.1369-7625.2009.00532.x. 19. Vale CL, Thompson LC, Murphy C, Forcat S, Hanley B. Involvement of consumers in studies run by the Medical Research Council Clinical Trials Unit: results of a survey. Trials [Electronic Resource]. 2012;13:9. PubMed PMID: 22243649. Pubmed Central PMCID: PMC3398265. English. 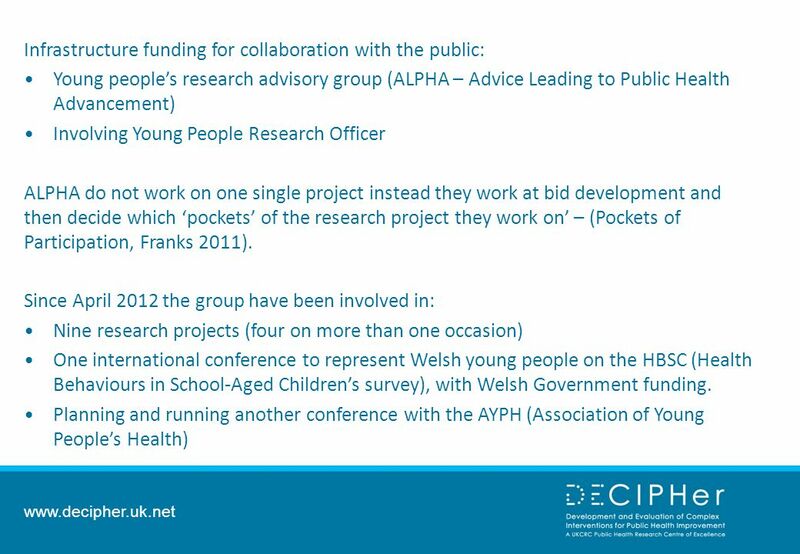 Download ppt "Www.decipher.uk.net Collaborating with young people through a research advisory group Hayley Reed Involving Young People Research Officer." Developing A National Early Parenting Research Framework ARACY Conference Melbourne 2 – 4 Sept 2009. Joint Information Systems Committee 01/04/2014 | slide 1 (E-)Assessment Guide Consultation Ros Smith, Consultant Joint Information Systems CommitteeSupporting. Mixed methods synthesis ESRC Methods Festival 2006 James Thomas Institute of Education, University of London. Interdisciplinary leadership Paul Blackmore Camille B. Kandiko Kings Learning Institute, Kings College London. EU Presidency Conference Effective policies for the development of competencies of youth in Europe Warsaw, 16-18 November 2011 Improving basic skills in.